Today's post actually started many years ago, when I was a Hospitalist taking care of a med/surg acuity patient on my service with a low magnesium level, and who needed intravenous (IV) magnesium replacement. After I entered the order for IV magnesium, the nurse taking care of the patient told me : "There is a new nursing policy on electrolyte repletion - If you want to give IV magnesium, you'll have to move the patient to a higher-acuity telemetry bed for monitoring, while we replace the magnesium." If you're not clinically trained, some brief explanation : Electrolytes are chemicals in your blood that you need to be healthy, and so too much or too little can be potentially life-threatening scenarios - but the dose of magnesium I was looking to replace was a fairly common practice, often used in alcoholic patients undergoing detoxification, who have not kept up with their nutritional needs. So this nursing policy would mean that alcoholics undergoing detoxification would require me to transfer the patient to higher-acuity bed and nursing care, if they needed to get their magnesium replaced intravenously. Wanting to understand and comply with the clinical standards of the organization, I sought more information and looked up this nursing policy. 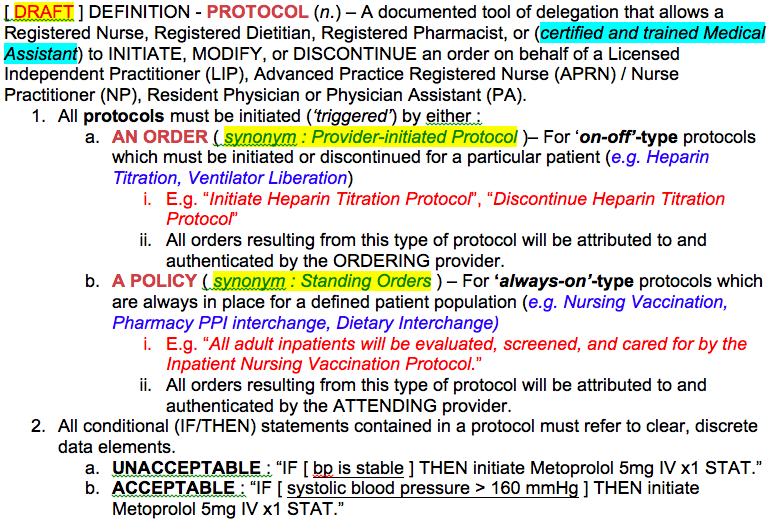 It basically stated, 'All patients requiring IV electrolyte replacement must be in a monitored telemetry bed.' Even if it might increase the demand for telemetry monitoring, the standard seemed to exist for a good reason - out of an abundance of caution for these patients - and so this nursing policy was signed off by nursing leadership. And yet, I couldn't help but wonder - Was this really just a nursing standard? Or a nursing-and-doctor standard? If the nursing policy essentially changed how and where physicians ordered magnesium on alcoholic detox patients, should it not have been reviewed by one of our physician leaders, who might have educated me about this standard at our department meetings? And yet, there was no review or signoff by anyone in physician leadership, probably because it was identified as a "Nursing Policy". It wasn't a big deal for me to transfer the patient to a higher-acuity, monitored telemetry bed, and the patient got the IV magnesium uneventfully, but they still had to find an available bed, and it still took me a little while to get my patient transferred. 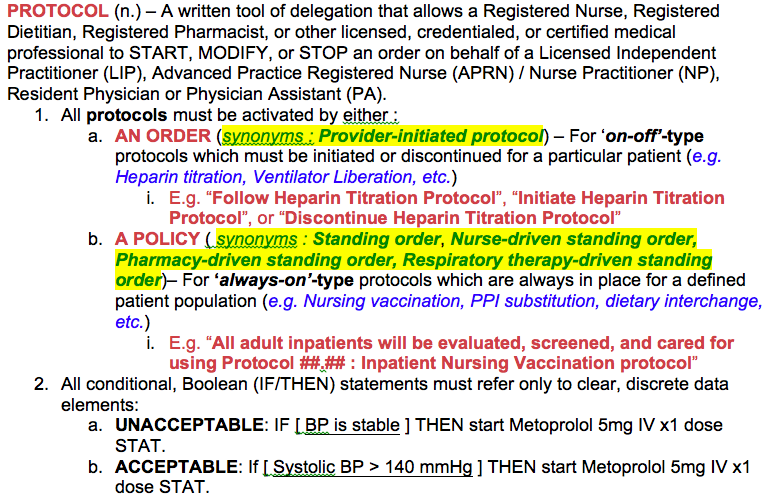 Since then, I've often wondered about this nursing policy, and how it impacts the configuration and use of Electronic Medical Records (EMRs) - Who exactly makes clinical standards, who reviews them, and who approves them? If nursing policies are standards only for nurses, should there also be doctor policies that describe the standards for doctors? Now entering my 10th year as a HealthIT professional (CMIO), I'm busy with EMR implementation, informatics design, and engagement of clinical staff, planning for workflows that deliver great medical care. And after engaging many physicians, nurses, pharmacists, and other clinical and administrative team members, I've still continued to wonder : What exactly is a "Nursing Policy"? What is a "Pharmacy Policy"? "Radiology Policy"? Are each of these tribes of modern healthcare living on their own islands, setting their own rules? What if we need to make workflow standards across these islands? After a great deal of analysis and evaluation, I believe I have some insight about these questions, which ultimately help answer this common EMR governance question - Who exactly designs, reviews, approves, and maintains the workflows of a healthcare organization? So I share what I think are the three key challenges that require discussion before we can have a better understanding of a typical policy manual. 'Clinical Staff' - Term sometimes used to refer to those people involved in direct patient care, e.g. Doctors, nurses, respiratory therapists, pharmacists, dietitians, etc. 'Administrative Staff' - Term sometimes used to refer to those people NOT involved in direct patient care, e.g. Administrators, finance, safety, engineering, human resources, etc. What about the Education department? Even if they don't provide front-line patient care, they are training the clinical staff on medical practice - So is that really an administrative function, or a clinical function? Or what about the Clinical Directors who run the clinical departments, but don't provide direct patient care? 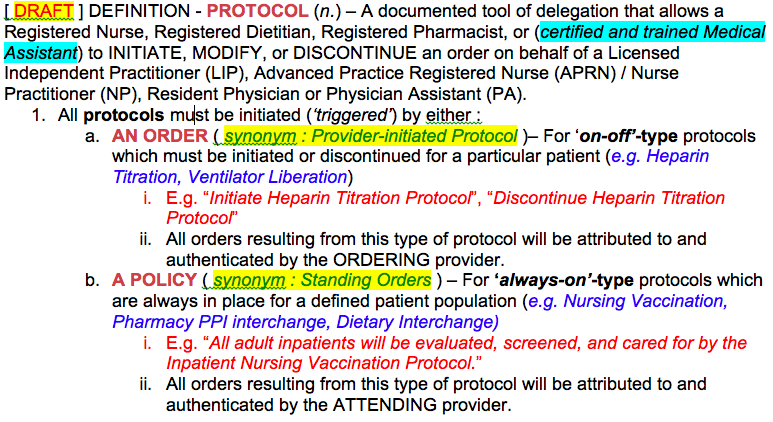 If they are designing order sets to update the care their staff provides in treating pneumonia, is that really an administrative function, or a clinical function? 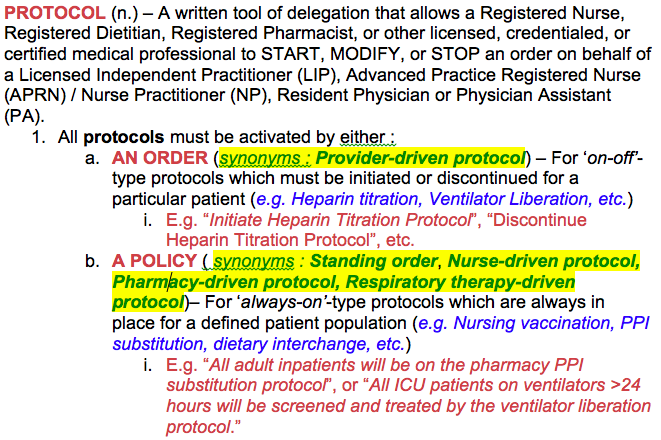 So the first step in understanding the policy chapters is accepting that these general terms may not be strict definitions, but somewhat ambiguous terms to loosely describe two different concepts - Clinical work (providing care? ), and Administrative work (somehow supporting that care?). B. THE SECOND CHALLENGE - WHAT EXACTLY IS A POLICY/PROCEDURE? PROCEDURES (aka workflows) = How you will achieve those standards, or "an ordered set of tasks that uses people, time, and resources to achieve a desired outcome." Looking at this index, it's only logical to ask - Who are these documents for? Are the nursing policies just for nurses? If so, where are the physician policies, outlining the physician standards? Don't we all work together to take care of patients? Where are the documents that span nursing AND pharmacy AND laboratory? There is a fundamental truth that's important to consider before we move on. Healthcare is a team sport - We all work together. Having standards on separate islands does not seem to help us all function together, so the idea of these standards all applying to (serving) different islands does not seem conducive to good teamwork and collaboration. So how does the Informaticist approach this challenge, and create clarity and definition? By reviewing the definitions, archetypes, and indexing for these documents! 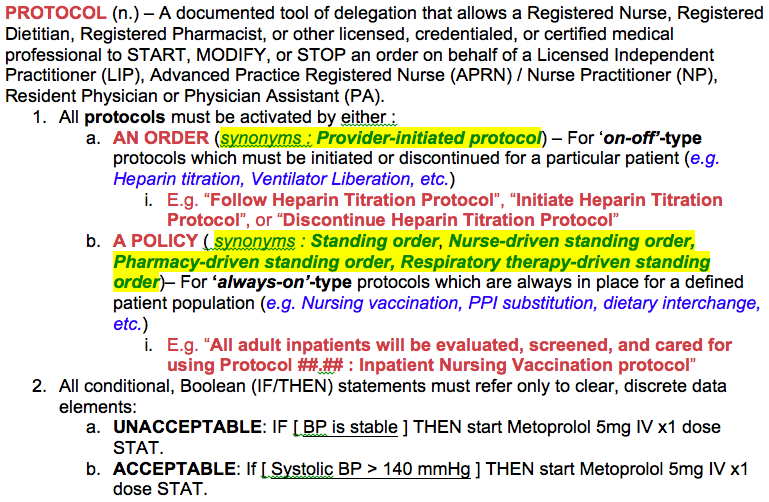 IF a "Nursing Policy" were really just standards for nurses, then it would be OK to have only nurses writing, reviewing, and approving them. But in my IV magnesium example above, this "Nursing Policy" impacted my (physician) ability to care for the patient in that location, and so I had to transfer the patient to another bed to get the IV magnesium. 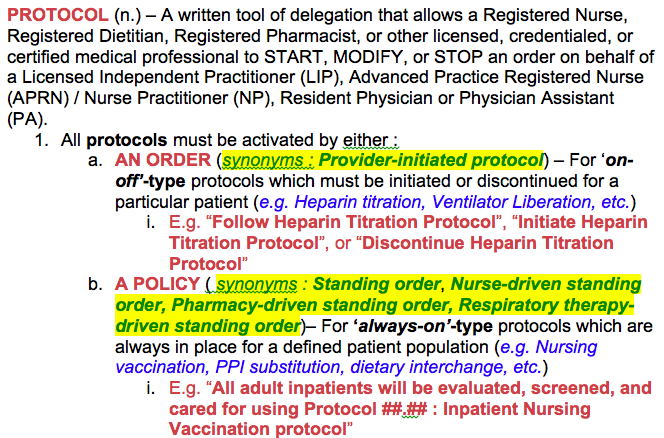 So I'd like to offer the argument that, perhaps, "Nursing Policies" are not simply 'standards for nurses only' - This nursing policy created a standard for my physician activities, too. And so I believe this is a compelling argument to say that the policy chapters are not describing who's expected to follow the policy. If that's so, then what exactly are the chapters describing? PRIMARY STAKEHOLDER (aka "Policy Author" or "Policy Owner") - The stakeholder with the time, training, expertise, and responsibility for creating, maintaining, and updating the policy. SECONDARY STAKEHOLDER(S) - Additional stakeholder(s) impacted by the policy standard, who for development and education purposes, are responsible for reviewing ('vetting') the policy before final approval. And if we can accept these expanded definitions for policy stakeholders, which separate the primary stakeholder from the secondary stakeholders, then we have a much better chance at decoding the policy manual! Maybe that "Nursing Policy" is in the chapter of "Nursing Policies" NOT because it's a 'policy that only nurses have to follow', but because nursing is the primary stakeholder - They had the time, training, expertise, and responsibility to create, update, and maintain the policy. And so as the physician who had to move my patient because of this policy, am I a secondary stakeholder, still required to follow the policy...? 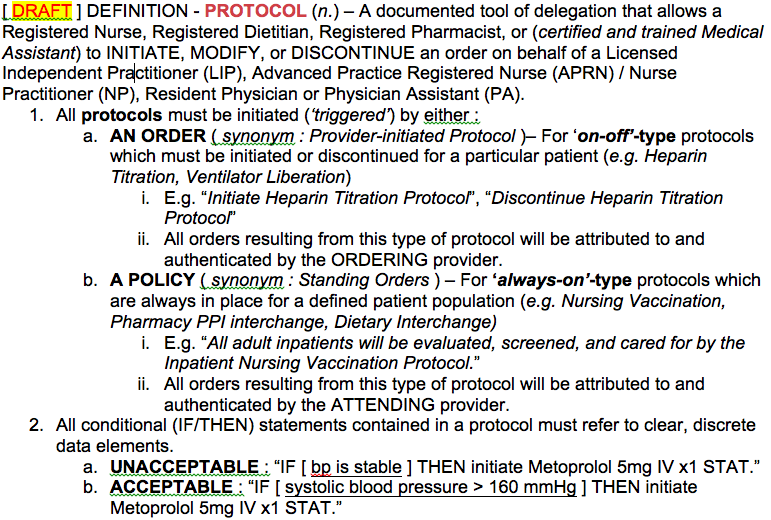 SO WHAT EXACTLY IS A "NURSING POLICY"? Healthcare is a team sport - We all work together to take care of patients. The terms "Clinical" and "Administrative" are not as well-defined as we wish they were - There are plenty of examples of roles and functions that overlap both. The chapters of the policy manual are probably not just describing the 'people expected to follow the standard'. More likely, the chapters of the policy manual are describing the primary stakeholders, with the time, training, and expertise to create, maintain, and update the policy. But each policy may have additional secondary stakeholders. Q : "What exactly is a clinical policy?" - A : It's an organizational standard that is maintained by a clinical department and listed in the clinical section of the policy manual. 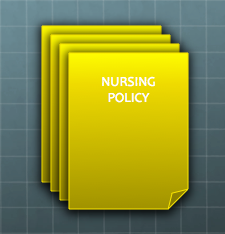 Q : "What exactly is a nursing policy?" - A : It's a clinical policy maintained by the nursing department. Q : "Do doctors have to honor nursing policies?" A : If physicians are a secondary stakeholder in the policy, and the procedure was reviewed and vetted by physician leadership, the answer is clear - absolutely, yes. Q : "If there are nursing policies, why are there no physician policies?" A : Probably because of the definition of the primary stakeholder (aka policy author / owner) - E.g. "A person with the time, training, and expertise to create, maintain, and update the policy." While physicians may have expertise about evidence-based practice, they also cost a lot in salary, and generally don't have the time, training, or responsibility to create or update policies. As long as healthcare continues to see this function as a nursing-only responsibility, these policies will probably continue to be published in the chapter of nursing policies. Q : "What's about education policies? Are they clinical or administrative?" 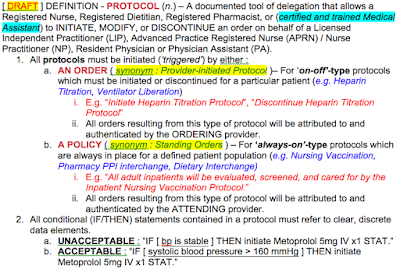 - A : They can be either, it doesn't matter so much about which section (clinical or administrative) they are found in. What really matters is that they create standards to ensure reliable education of all employees on important operational issues. Q : "So do we really need to divide the policy manual into clinical and administrative policies? What good does this serve?" - A : I think many in healthcare have historically made this distinction because, in general, it's hard to be good at both, e.g. there are not many people who are good at both financial planning and treating pneumonia. The terms loosely describe a focus, with different skill sets that both require a long and different educational pathways. So using these terms may loosely help us plan for resources, such as the general hiring/training of staff. But it's still important to note that these terms are somewhat vague, and may also create unnecessary divisions and confusion when it comes to shared decision-making across the organization. Q : "So if I want to write a policy, how do I do it?" A: It probably makes sense to first identify the standard (policy), and the steps you will use to accomplish it (procedure). 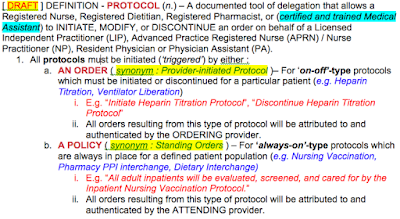 Once you have the procedure written, it should help you figure out all of the stakeholders involved - Nursing, physician, pharmacy, lab, education, HR, housekeeping, finance, etc. Once you have all of the stakeholders identified, then you'll need to figure out who will be the primary stakeholder, responsible for getting all of the secondary stakeholders together, talking about the policy, and securing their buy-in, working out the details, getting it approved, and then finally, publishing it in your chapter of the policy manual so that you will revisit it regularly and make sure it's still meeting your needs. Please remember, this is all just an educational discussion, and since I'm not a lawyer, the [DRAFT] answers I've offered above depend largely on your organization's willingness to adopt some of the [DRAFT] definitions and processes I've offered in this post. Your mileage may vary considerably, and so before making any changes, changing any definitions, or answering these questions in your own organization - Please make sure to discuss with your senior leadership and review these definitions with your own legal and clinical informatics teams, to make sure they make sense to your organization, before you consider formally adopting them. A big special thank you to mentor and quality guru Dominick Lepore, MS CTRS for sharing every lesson learned. Have any thoughts or comments you would like to contribute? Feel free to respond in the box below. 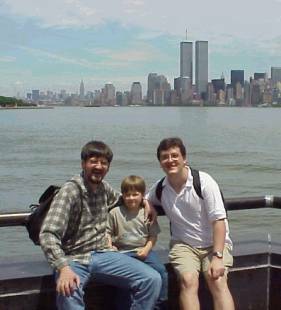 Just taking a brief break from my routine posts about clinical informatics, to help repost a story about my experience on 9/11/01. It was originally posted on an old web server at http://www.westnet.com/~ds/wtc.html but since that server is no longer functioning, I wanted to move it somewhere else, until I can find a better home for it. I started writing down the story below on 9/14/01 (the weekend after 9/11), and finished it about 9/21/01. I quickly wrote everything I could remember, because I knew that one day I would want to remember. Since the original recording, I've made a few edits, usually when I found a new picture or had to correct something (such as the photographer from our site), but otherwise, the story is largely intact from the original version. There are some edits of this story archived in the 9/11 historical record. 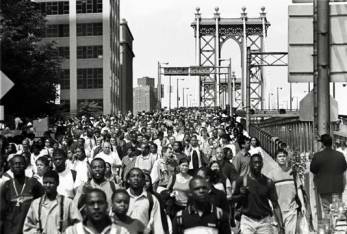 Sixteen years later, I'm amazed at the deep emotions New Yorkers still feel about this day. 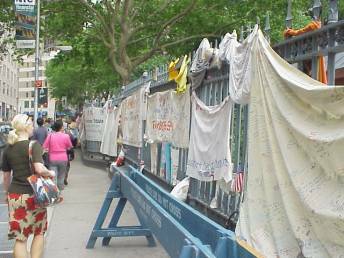 It's just as heartbreaking today, to learn of the people who lost their loved ones, as it was combing through the missing persons flyers posted on the walls of the Grand Central and Times Square stations back on 9/11/2001. 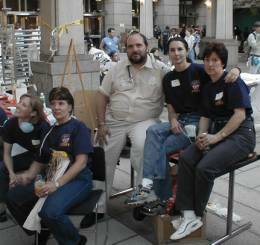 I'm so thankful to have worked with FDNY, NYPD, and many other medical professionals who all showed their best on this day. I'm only sad that it takes this kind of senseless tragedy to be able to see the best of human cooperation and compassion. Finally - Some of the links in the story no longer reference the original pieces, but I left them (for now) just to maintain the history of the piece. If I can find the time, will see if I can dig up the original materials and see what I can do to fix them. Thank you for allowing me to repost this story, and I promise my next post will return to my usual musings on Health IT and clinical informatics. (1) I typed this all and put it online for my own therapy, for historical purposes and in case anyone wanted information, not for any commercial or other purpose. 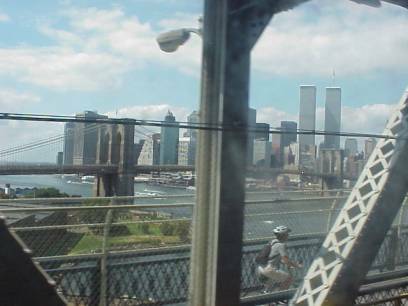 (2) I have updated this page with some pictures from 9/11 which were obtained from public 9/11 photo web pages. If anyone owns the rights to these photos, please let me know and I will gladly remove them. 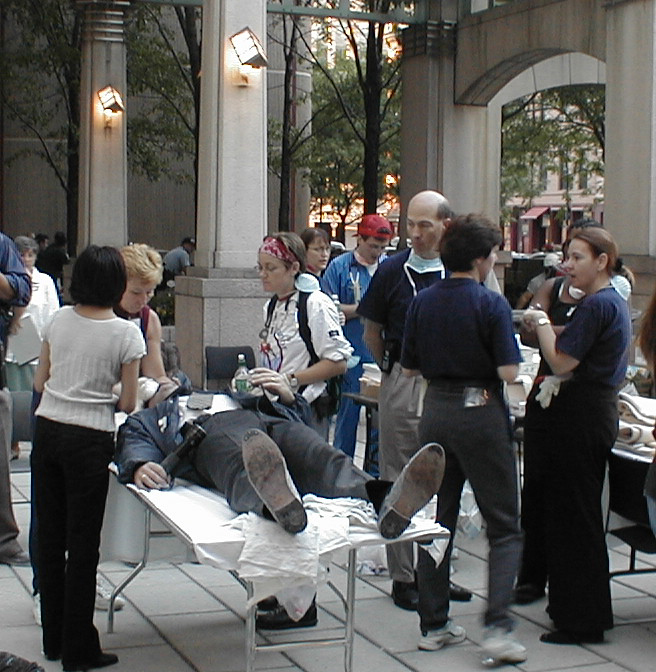 On September 11th, 2001, I was a third-year medical student working at Brooklyn Hospital, only a block from the corner of Flatbush and DeKalb avenues. I had just started my six-week pediatric rotation the day before. Our morning started around 9:00am with the pediatric morning meeting and case presentation. Right before the meeting started, I remember someone briefly mentioned, "Hey, did you hear there was an explosion at the World Trade Center?". 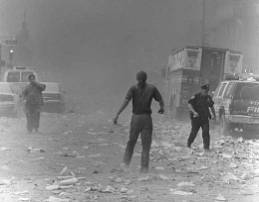 Having been in NY for the 1993 bombing, I guess I realized the potential for a disastrous terrorist attack, but the more likely rationalization (before 9/11) was that an air conditioner exploded or something small. PERHAPS a small plane flew into the WTC. But it barely seemed worthy of attention, and we all returned to our meeting's agenda. When the meeting finished at about 9:45, I started to walk out of the conference room when one of my classmates ran through the hall saying, "Oh my god, did you hear? One of the Twin Towers fell!" However, I have a very close friend Dave who actually worked in the WTC. (He started working on the 56th floor of Tower 1 about three weeks before.) At that point, starting to believe one of the towers might have actually fallen, I suddenly started to really worry. I could feel my heart racing. On the TV, all I saw was one tower still standing, burning, and the other collapsed. Suddenly, all I could think about is my best friend Dave. He just started his job there about three weeks ago. Which tower was he in? What floor was he on, again? I started to completely panic. I was really worried that he was in the building. I started to react in a strange way, kind of a cross between crying and hyperventilating. I picked up the phone and called his apartment - Nobody was there. I called his dad. I left him a message, asking him to call my cell phone if he knew Dave was OK. I called my own parents, asking them to find out if Dave was OK, and to call me as soon as they heard anything. Nobody was home. I must have looked awful at that point, because Scott the PA and the nurses in the unit started to try to calm me down. They were saying things like, "Calm down, which building was he in? Maybe he was in the other building?" I didn't know. I started to think, "Yeah, maybe he *is* still in the standing building", when suddenly, I watched on TV as the second tower went down, the newscaster screaming "OH MY GOD, THE SECOND TOWER IS FALLING!!" It really sank in that the WTC had actually fallen. It wasnt in the skyline anymore. The magnitude of such an event was enormous, and I guess I realized the nursery was the last place I wanted to be. Having five years of experience doing EMS up in Westchester, I guess it kind of came naturally to me to tell the nurses, "I think they might need us downstairs", and I left (with Scott in tow) to go down to the ER. I walked out to the ambulance staging area (again with Scott in tow), and all I saw were thousands of people walking up Flatbush Avenue. Some were completely covered in dust. Lots were crying. I realized this was not a joke, this was not a test, this was really happening. And again, all I could think about was my best friend Dave. Not being able to imagine anyone surviving that, and knowing that hes usually early to show up for work, I actually had the full suspension of belief that he had died. At this point, the best way to describe my emotion was a mix of helplessness, anger, and sadness. I was crying uncontrollably. One of the residents (Mike Lynette) came up to me and suggested I sit down and relax. I didn't feel comfortable with that idea. One of my classmates, Nazli, came up to me and let me cry on her shoulder for a moment. Between my sobs I tried to explain why I was freaking out. "My best friend works in the Trade Center!" Somehow it seemed really silly that I should be freaking out that much about a best friend, but since I have so little family in America, my best friend IS my family. Dave is like an adopted brother to me. So when the security guard came up to me and tried to get me to calm down, I told him, "My brother works in the World Trade Center!" He seemed to understand my anguish better. With that, I started to walk in the opposite direction of the mass of people. Scott the PA asked me where I was going. I told him, "I'm going down there, they're going to need help." Scott looked like he wanted to follow me, but he looked nervous. "Scott, seriously, stay here," I told him, but he seemed to cautiously follow me instead. "Do you think we'll get in trouble for leaving the hospital?" he asked. "Well, the World Trade Center just collapsed, sometimes there are bigger things to worry about than getting in trouble." With police holding all non-emergency vehicles at a standstill, Flatbush Avenue was in complete gridlock. The road going over the Manhattan bridge was basically empty to vehicles, but was moderately congested with people running away from Manhattan. I remember seeing a few odd things -- One man dragging his suitcase. Another man rolling some kind of a clothes rack. 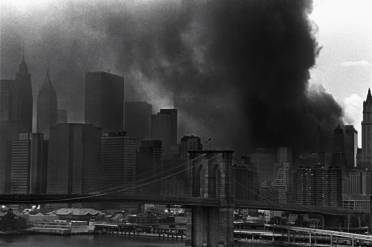 We waited there for a minute, looking at the large plume of smoke coming from the southern tip of Manhattan, and all took a moment to think twice before crossing the bridge going over. While we waited there, we were joined by another doctor who identified himself as a radiologist. I think he said he worked at Mt. Sinai or somewhere. He joined us as we stood there, listening to the sirens, and watching the occasional emergency vehicle race over the bridge at breakneck speeds. I'm not sure what the building was, in retrospect. It looked like some kind of a grey, concrete-and-marble, federal/school-type of building, just a few feet south of the Manhattan Bridge. All I know is that she was up on the second floor, and the building had some kind of a nurse/infirmary that we were able to get some makeshift supplies from. We first evaluated our pregnant mother in front of us. The radiologist put on gloves and reassured the mother that she was going to be OK. He then quickly examined her, while the rest of us prepared for an impending delivery by opening up boxes of maxi-pads and paper towels. I think we might be needed down there." So the four of us walked up to the foot of the bridge again. We waited there with the officers standing guard, and asked if any vehicles were crossing over. "Well, yeah, they're going over, but I don't know when the next one is coming." We waited there watching the flow of people over the bridge ebb, and when no vehicles came for four or five minutes, we figured we would hoof it. With the policeman's permission, we started walking over the Manhattan Bridge towards Canal Street in Manhattan. As we walked over the bridge, I was in full EMS-mode. Ray Thompson, my EMT instructor from way back when, always talked about the need to be resourceful when times are tough. The example Ray always talked about was using a car visor as a splint, in a pinch. So as we walked over the bridge, I found some long steel bolts, about 18 inches long, that were lying on the side of the roadway, apparently left there by workers who were repairing the bridge. I thought to myself, "What great splints these could make!" as I grabbed two of them and kept walking. So when we hit the gridlock awaiting us at the other end of the bridge (Canal Street was being closed and was full of emergency vehicles and other cars stuck in the confusion), we exited the car. The radiologist headed north to his hospital, and Scott, Robert, and I walked south on Church Street. As we walked south, we were still fighting against a big crowd of people running north. At this point, not too many were completely covered with dust, as we saw in the earlier crowd. They were still crying and anxious, but there didn't seem to be anybody to treat. We walked about three blocks south, and stopped in a Korean Grocery. The sun was actually pretty hot that day, and Scott was complaining of the heat. I think Robert also suggested that we get some water, not only for us, but for emergency purposes. We walked into the grocer and asked for water. I wasn't sure if we were supposed to pay for it, or not. I hoped that they didn't ask us for money, since none of us really had any. Robert came up with some cash, which we offered, but the grocer seemed to understand this was not a normal circumstance. Thankfully, when they saw us in our scrubs, and Robert in his white coat, they gave us several bottles of Evian for free. We took a few sips and packed the rest into our plastic bag / makeshift first-aid kit, and headed further south. We walked only a few blocks further south, the sky getting darker, and the dust getting so bad that I had to squint to keep it out of my eyes. The space between my mask and my face became very apparent, since I suddenly tasted the dust. It felt and tasted like a cold, gritty material. I figured it was a mixture of concrete and maybe very finely ground glass and asbestos. Scott started to get nervous again, and Robert and I offered him the opportunity to go back, but he followed along. As we turned onto Fulton, the scene changed dramatically. Now the dust was very bad. Breathing became very difficult, even with a mask. It no longer seemed like daytime - When I play this part back in my mind, it seems like it was midnight. Only later when I stopped to really think about it did I realize it was daytime. To give you an idea of the mood at this point, I can only describe it as being similar to the final scenes in the movie "Titanic", when Leonardo DiCaprio and Kate Winslett are below deck as the ship is sinking, and they see the random person running off with their suitcase, and another person running with their child and a bag of clothes. This was very similar in feeling. I remember seeing a random businessman trying to make his way home, and a person carrying a plastic bag as they walked north. There was also the strange feeling that something worse could actually still happen. I didnt know if we should be expecting more, like an atomic blast, but again I figured it was probably over, and if not, this is how I wanted to spend my last moments  Trying to help someone. The roads were strangely quiet. Not a single sound. Stores were all closed. Those that had metal grating in front had closed them in a hurry. Some stores had messy makeshift signs saying "CLOSED TODAY" hung in front of them. There was a small group of 2-3 teenagers looking nervous as they stood in front of a broken storefront, looking inside the store. I thought they might be looting, which pissed me off. I walked up to them to try to figure out what they were trying to steal, since the store looked like some kind of a jewelry store, and briefly said, "You guys aren't seriously looting, are you? but then they looked back at me, and I realized that if an altercation were to happen, the police wouldn't be there to investigate. So I left them alone, and the three of us continued walking up Fulton. And in the midst of all of the doom and despair was suddenly this young woman, in her 20s, who was standing on a street corner all by herself. She had a shopping cart full of bottled water and paper cups. She was offering it to anyone who walked by, to help wash out their eyes. I thought it was peculiar that she had paper cups -- It seemed like such a nicety in the middle of all of this, an unexpected sign of civilization amidst the chaos, kind of like making sure your suit is pressed before you're going down in the Titanic. But she stood there, alone, offering it to the few people who were still there. The dust was pretty thick at this point. I remember looking down and noticing it was up to my ankles. Suddenly, there were women's shoes all over the street. I was trying to figure out where they came from. Morbidly, I thought they might have been from the passengers in one of the jets, but more likely they were women's shoes that were quickly discarded as people fled the scene quickly. We walked on, looking for anyone, any cries for help, when suddenly we came upon what I call "THE STUMP". The Stump was the remaining pile of burning debris that sat there at the site of the former Twin Towers. It burned intensely. Not just a crackling-type fire, but a real blow-furnace type fire, like when they are blowing glass and put it into that inferno to melt it. The WTC was right in front of us, the pile several stories high, burning intensely. And despite the bright, shooting flames, it still felt like nighttime. The dust was so thick that the light from the flames barely reached us. 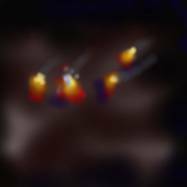 (My crude computer graphic demonstrating what I remember seeing, when I replay it in my head  Smoke and some intense fires burning. which was a really not a good idea since the wind was blowing all of the smoke and ash eastward that day. So we kept walking around. At one point we were picked up by a Hatzollah Ambulance that was partly crushed, its front windshield cracked, but it was still driveable. We jumped in and joined several orthodox EMTs who were also looking for where to go. They were a very nice bunch. Apparently, they were right under the overpass that led to the WTC, when it collapsed around them, and their ambulance got stuck under part of the overpass. Rather than just sit there helplessly, though, they managed to wedge it out from the overpass, and kept driving around, looking for where to go. The corner of Greenwich and North Moore, 388 Greenwich Street, is the site of the Citicorp building. It was an ideal place for a triage unit. It has a decent sized courtyard, perfect for setting up the triage area. It has a good stretch of street in front of it, perfect for setting up an ambulance staging area. 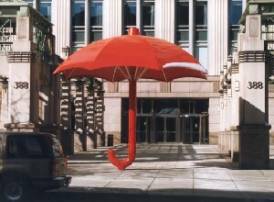 And it has a big red metal umbrella -- A piece of modern art -- But the big umbrella made it feel safe, and was a good place to tell people to meet when nobody knew the area. So suddenly the leader inside me came out, and I started barking out orders and assuming control. I don't like to toot my own horn, so let me just say that it was very Forrest Gump-ish. I was just the right person with the right training in the right place at the right time. I don't think there was anything to it, really, it just needed to be done. 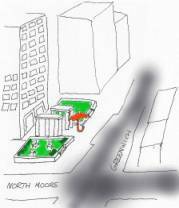 So I started barking out orders and began to organize the triage effort there on the corners of Greenwich and North Moore. So, basically, I just started to delegate. And I guess people listened to me. Suddenly I found people coming up to me asking me what to do, and soon I found myself setting up the site. I guess at that point Robert was put in charge of organizing our first line of triage. Scott complained about the heat. I'm not sure if he was anxious, but he tagged along, and helped our team. We had put about an hour of work into organizing our site, and the building manager from the building had just stepped over to tell me they were making the entire building available for the triage effort, when suddenly I saw a group of very official-looking fire officials walk up to our site, which had by this time become semi-organized. At least people were split into the proper triage areas, we had ambulances lining up, and people were assigned specific tasks. The police had roped off the area. One of the FDNY officials was Lieutenant Top Eppinger, who strangely enough is a spitting image of my old EMT instructor's son. I actually thought it was him at first. Lt. Eppinger stepped into our crowd and asked, "Who's in control here? Having worked with firemen before when I did EMS up in Westchester, I know better than to try to step on their territory, so I told him, "I'm not in control, but I'm trying to organize things so far!" And so our site was finally set up. We had doctors from practically every medical field - Pediatrics, OB/GYN, Radiology, Surgery, Neurology, Internal Medicine, Emergency Medicine, Cardiology, Psychiatry, and Family Practice. We also had nurses from every specialty I can think of. The only problem was, as the New York Times reporter Matthew Klam said in his description, we needed bodies. That is, we werent getting a whole lot of patients coming our way. And this led to frustration. Although we had treated about 10 patients by that time, mostly for minor injuries and chest pain, it didnt seem like enough, and people were getting antsy. Of course, everyone was so anxious that the only way they could feel any control of the situation that day was to help someone. But without people there to help, it left people feeling demoralized. The first sign of frustration was seen when the surgeons seemed to run off, leaving Paris in the MERV by herself. One of the last surgeons I talked to said something like, Nothings happening here, Im getting out of here. With that, he left us. As the afternoon wore on, and people were getting tired, Marianne McCune, a reporter from NPR, came by our site. She wanted to give a report live, but her cell phone had run out of power. She borrowed mine and was able to give her report. After making the call and being on the air live, she interviewed me and recorded the interview on her tape recorder, as I described the layout of the triage site. Her report was later aired (I had friends in North Carolina and Massachusetts tell me they heard me), and I recently found it on the WNYC web site, in RealAudio. 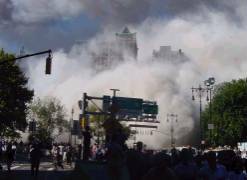 Although people were getting frustrated without more patients, there was actually a moment of excitement mixed with panic when 7 World Trade Center seemed to buckle, and finally collapsed as we all stood by on Greenwich Avenue and watched. I didnt realize how close we were, but when it collapsed, the smoke came up the canyon towards our site, setting off a stampede of scared people. The stampede almost ran over everyone in our site, while I yelled SLOW DOWN!! DO NOT PANIC! ! at the top of my lungs, leaving my voice sore until the next day. You can hear me screaming on the NPR report, right after my interview gets cut off. It was odd to watch 7WTC fall down. It almost seemed unimpressive, compared to the destruction that was already there, but a new plume of smoke certainly scared people. I understand some people in our counseling group were physically injured as the crowd broke through the yellow tape and rushed our triage site. 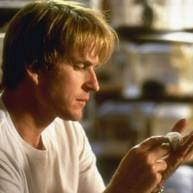 Fortunately, Matthew Modine, the actor and star of movies like Full Metal Jacket, Gross Anatomy, and As The Band Played On, stopped by. He tied a piece of yellow police tape around his arm (the sign that we were using for people who belonged on the site) and joined us. Mr. Modine was very nice. I talked to him and thanked him for coming down, and he said something to the effect of whatever I can do to help support you guys, Im here. I actually think it helped people from getting frustrated. At least if there is a celebrity at your site, people think its worth sticking around for. but Im guessing its from a movie. The group of volunteers across the street in front of the Ryder sign had now swollen to hundreds. People were coming up to me constantly, asking how they could help. A few people stand out in my mind. One man could barely speak English but said I am a metal cutter, how can I help? Another man told me he was a rescue worker in Israel and wanted to help. Another man told me he was from Poland but was a construction worker and wanted to help dig through the rubble. I had to focus on keeping up the medical effort of our triage site, so I sent them all over to the corner under the Ryder sign. Our total patient count? 19 patients. We treated a few patients with chest pain and respiratory distress, but most were patients with minor bruises and cuts, and a few came to us just to have the ashes washed out of their eyes. Even our fearless counseling team was demoralized, having been unable to offer assistance to any of the firemen who came to our site with stories of having lost so many of their co-workers. At that point, I informed the various medical team leaders that the site was officially closing up. I asked people to stay to help put the equipment into ambulances so that it could be brought to St. Vincents hospital for further use, but of course, people generally dont like to clean up after their mess. So I ended up cleaning up the site with a few other key leaders, until about 10:00pm. And around that time, I started to head uptown with Robert Cartwright, Scott, and Scott Caruthers, one of the ministers in our fearless counseling group. As we walked north on Greenwich, now dark and empty, we passed several fire trucks loaded with firemen. The firemen were covered with the soot and ash from the collapse, and were collecting their hoses and fixing some of their gear. Everyone was so tired from the day we had all just had. 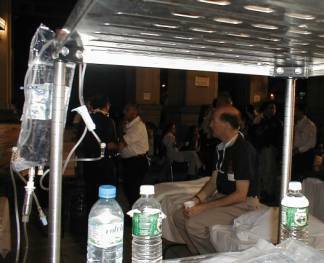 Although our medical team was completely exhausted, I knew their day was far from over. I gave them all a tired smile and said thanks to them, as we walked on, looking for a subway. It was strangely quiet for downtown Manhattan. The Canal Street subway station was closed, but we walked further north until we found an open station. MTA was not even collecting fares  The subways were running for free, to allow people to get where they needed. The N and R trains were not running, since they run right through Cortland Street and the WTC site, but we managed to find a Q train back to Brooklyn. Theres really not a way to explain how that day has affected me. I know its different for every New Yorker. Many families senselessly lost loved ones. Some raced in to help rescue people and to put out fires. 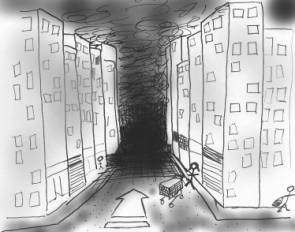 Still others have lost their jobs, their apartments, and their livelihood. There are too many things to be said about that day, and I dont think any one person can ever really get the full picture. I think a lot of us keep trying to understand it by asking everyone we know what happened, where they were and what they were doing that day. And every persons experience helps put another piece of the puzzle in place, to try to make sense of what happened. But this puzzle is too big -- Nobody will ever really understand all of the pieces of the puzzle. The best you can do is to ask the people who lived through September 11th, or the people who have lived through any war or senseless tragedy, and let their accounts give us all a little more insight into humanity. Its been SO overdone in the press and the media. I feel like all of the exposure takes away from what really went on there that day. Although I guess its just human nature to be fascinated with such an event, and the networks are just responding to what their viewers want to see, the actual understanding of what happened that day has been so watered down and devalued. Im also upset when anything from 9/11 gets used as a tool to argue for going to war, or to treat people differently. Im not that much of an idealist to say its not all warranted, and there probably are some security changes that we should have made a long time ago, but there are also a lot of changes that are excessive, and it bothers me to see people who werent there pointing to the twin towers to support their argument. I also think that since 9/11 there is excessive paranoia about foreigners and terrorism in general, but who knows? I could be overly confident that we wont see something like this again. If anyone really wants to know what it was like to be there that day, I can only offer this advice : I dont think you can get it from just reading about 9/11, the WTC, and the Pentagon. I think you have to dig deeper into all of the conflicts of the world, including every battle and every world war. Anyone who has survived hatred or war can tell you what it felt like to see society turned upside-down. Fortunately, when there was complete social breakdown in lower Manhattan that day, almost everyone standing responded with the best of humanity. Im still so proud of the way everyone reacted to the event. Its like there was an innate sense of humanity that rose to the surface of our city. Its comforting to know that just beneath the surface of our everyday worries and arguments and fights and moral wrongdoings, lies something very beautiful that can spring up when the need arises. I hope I can offer these thoughts to anyone who feels like theyve lost their faith in humanity. As for the new buildings, I think it would be great to rebuild the old buildings, move them over so theyre not on the footprints, and maybe even make them ONE floor taller  Just to show our ability to heal from such an attack. But, Im not on any committee to vote, so my opinion wont count much, but I have faith that whatever gets built there will be distinctive and will honor those who lost their lives that day. Soon it will be three years that have gone by since THE 9/11. Saw Fahrenheit 911 a week ago, hard to believe how the world changed in such a short amount of time. Looking back, we all sort of knew it was coming - There was some discussion that day, on the streets around the fallen debris, about 'Do you think the world is going to be different tomorrow? ', and of course, it is. Again, I'm not sure this is surprising, but what continues to amaze me is how a few angry people did so much damage. My heart still goes out to everyone who lost a loved one that day, or who had to see a broken New York City, or who missed seeing a broken city heal back stronger than ever before. Eagerly awaiting the memorial and new 'Freedom Tower', so I can have something to tell my grandchildren one day. Now just a distant memory, it's hard to believe that these event triggered the current war effort. It almost feels like the two are separate events, but of course, I keep reminding myself that the two are linked. Anyway, some exciting news appeared recently, I thought I would link to it. Two architects have come up with a plan to redesign the World Trade Center towers, with 2005 technology. Donald Trump recently supported it, and I really liked the idea, so I thought I would let people see the models and plan here. Was just reading an article in the New York Times about 'who owns 9-11'. I think everyone owns it in some way - Who on the globe didn't experience it and wasn't traumatized by what we watched? At the same time, it still really upsets me when people use it to further their cause. And it bothers me when people compare it with other atrocities and other killings, as if one was worse than the other. Yes, perhaps it was one of the most dramatic things we've seen on American soil, but wars and senseless killing have sadly gone on throughout world history. Perhaps the lesson we can learn is about how to stop this from happening in the future - Preventing terrorism, solving political strife, building even safer buildings, and most of all, the hardest part, learning to stop hating each other. Unbelieveable that it's been five years now. Seems like a good year to reflect. So we're approaching the 10 year anniversary of the attacks. At this point, it all seems so distant - I'm glad I wrote this page, or else I would have trouble remembering all of the details. I've managed to link the ABC news piece here on YouTube. (God my voice sounds reedy and thin in this interview - Trust me, that day I channeled someone else by putting on my "authority voice".) :) I've also related the story to a few people, gotten some emails from other people, and fortunately I recently identified the photographer for a few of the pictures - who it turns out was at our site. In the public discussions, there has been some controversy about the new construction at the site, the memorial, and of course the famous mosque controversy... Again, my sincerest hope is that the anniversary isn't used to divide people and grow hatred. I'm hoping to reunite with some of the other people at our site that day, just to pinch myself and make sure it wasn't all a crazy dream. Also I now have kids, so I'm hoping all of this will help me tell them the story of what happened to us all that one day back in 2001. Thanks for taking the time to read my page.